Easter, like many modern holiday celebrations has experienced a metamorphosis after being filtered through numerous and various cultures, religions, and yes even marketing teams over many, many centuries. Why is Easter sometimes in March and sometimes in April? How did the Easter bunny come into play? What about the Easter basket? March Hare Madness: Every March, hares go crazy….running around chasing each other down. Some fight over territory and some seek only to increase the population. Long ago people witnessed this and figured that the transition from winter to spring caused the hares’ collective loss of sanity. It was actually part of their aggressive mating habits, evidenced quickly when the same people were up to their elbows 30 days later with cotton-tailed critters. Consequently, the hare became a symbol of fertility, as did the egg since birds have the same frisky custom as hares, and was championed as a symbol for nature-worshiping pagan spring equinox celebrations. Christianize It: The spring equinox festival fell in March, around the same time the Catholics were celebrating the resurrection of Jesus, so the Church made a few compromises. The holiday would be named after the Anglo-Saxon goddess Eostre, but it would fall on the first Sunday following the new moon, which is between March 22nd and April 25th, to coincide with the anniversary of Jesus’ resurrection. Eventually, people realized Eostre was really hard to spell and so the name was simplified to the similar sounding “Easter” that we have today. With the original pagan name lost, you’d think that the rest of the pagan traditions, like hares and dying eggs would disappear as well – Not the case. During the 16th century Easters, the Germanic people were celebrating the fertility of the rabbit and ceremoniously dying eggs. The Roman Catholic Church was expanding and finding ways to assimilate their celebrations and customs with those new to their religion so the church played it cool, and the eggs came to symbolize rebirth and Christ’s resurrection. Today, in Greece and parts of Russia, Easter eggs are dyed exclusively red to represent the blood of Christ. The Easter Bunny Lays an Egg: As the popularity of this new tradition grew with the further expansion of Catholicism, it collided with cultures that had no idea what a hare was. The bunny rabbit, in population and linguistics, was much more common, and eventually became the Easter symbol that we know today. Nobody knows for sure, but sometime during the 17th century, Germans began telling their children to hide hats and be good so that the Easter bunny would lay eggs in it. When these Germans migrated to the Pennsylvania Dutch country – the tradition followed. By the mid-18th century, children from the Holy Roman Empire to the colony of Pennsylvania were spending Easter hiding hats and bonnets in their homes with the hope that they had been good enough for “Oschter Haws” to lay colorful eggs in the hat-nests. It not only gave the dyed eggs a purpose, but there were a lot of eggs stockpiled because the Catholic Church forbade the eating of eggs during Lent. So, we have the Germans to thank for the Easter Bunny. Baskets Made it Better: It probably didn’t take long for some kid to cry, “I don’t want a rabbit giving birth in my hat! I gotta wear that hat.” The Easter basket was an easy replacement. Some kids would take the colorful eggs to their parents and exchange them for sweets or gifts. 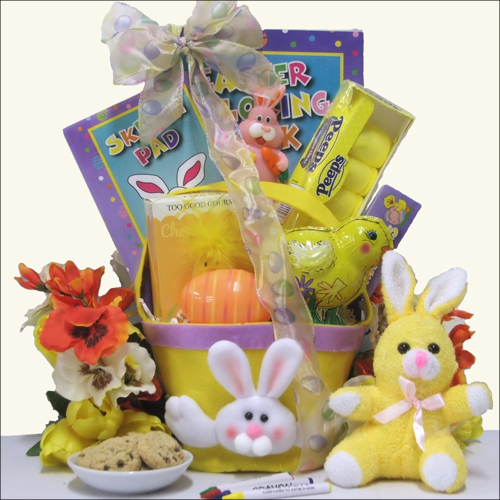 This practice evolved over time and today “Oschter Haws”, now called “Easter Bunny” skips the middle-man entirely and just puts candies and gifts in the basket along with a few colored eggs – the birth of the Easter basket. As adults we all know we can’t rely on a bunny in a vest bursting into our home at 4 a.m. Easter Sunday and firing off a few eggs and candies into that basket stowed away in the linen closet. You’re the one who needs to pick out these prizes – so put on your bunny ears & get hoppin’ – Happy Easter! Great information on the origins of Easter…..things I didn’t know! Thanks! Thank you Kimberly – so happy you enjoyed it! Thank you Christine – I really enjoyed this!